Here we come to the difference in sound qualities that the music gains in this style of performance. The greater speed of attenuation on the notes, means that de Hoog plays at quite fluid speeds and there is a greater range of tone, also the rhythmic underpinning can be more obvious. Most of the movements are based on dance rhythms and whilst you could not necessarily dance to them, the rhythm is still there. De Hoog also brings a great range of colours to the music. The five-string cello has a rather interesting, darkly evocative sound, and it is clear that though Bach uses it sparingly, there is rather more double stopping in this suite. We don't know a lot about this music, neither why they were written nor for whom. Though we think of six suites, there may originally have been two sets of three, and we don't know whether the movements were all written together. This leaves a lot of scope and it is lovely to find cellists going back to something like first principals. The disc captures the cello well, there is a lovely depth to the sound but we are close enough for details to tell. The record has not been closely edited so that we are made to imagine that playing a baroque cello is perfection, there are moments when you are aware of technical feats happening and they give a real sense of the performer. But then, the recording producer was Robert King, a performer himself. The discs come with an admirable selection of articles about Bach's music and the cello during the baroque period. The discs are being sold as two for the price of one, so the result is something of a bargain. 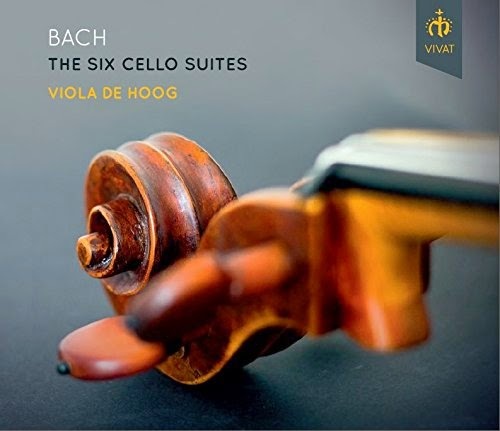 I would not want to be without a recording of this music played sympathetically on a modern cello, but Viola de Hoog gives a fine account in period style. She takes us on a real exploration of what it means to play this music on the cello of Bach's day, and how it can be made to work. Essential listening.